The U.S. isolates itself further as all other 14 UN Security Control members back the measure. The United States on Monday vetoed a draft UN resolution rejecting President Donald Trump's decision to recognize Jerusalem as Israel's capital, after all 14 other Security Council members backed the measure. Soon after the clash at the top UN body, the White House announced that U.S. Vice President Mike Pence was delaying a trip to the Middle East planned for this week. Trump's December 6 decision to recognize Jerusalem as the Israeli capital broke with international consensus, triggering protests across the Muslim world and drawing strong condemnation. Key U.S. allies Britain, France, Italy, Japan and Ukraine were among the 14 countries in the 15-member council that voted in favor of the measure put forward by Egypt. The draft resolution reaffirmed that Jerusalem is an issue "to be resolved through negotiations" and that any decisions on the status of Jerusalem "have no legal effect, are null and void and must be rescinded." To win the 14 votes, the text was watered down with no condemnation and no specific mention of Trump's move. Instead, it expressed "deep regret at recent decisions concerning the status of Jerusalem." Resolutions presented to the council require nine votes for adoption, but the United States, along with Britain, China, France and Russia, have the power to veto any measure. Israeli Prime Minister Benjamin Netanyahu immediately thanked Haley, posting on Twitter: "Truth defeated lies. Thank you, President Trump. Thank you, Nikki Haley." The Palestinians slammed the veto as "unacceptable" and vowed to turn to the UN General Assembly to win adoption for the resolution that was blocked at the council. No country has veto powers in the 193-nation assembly. "Regrettably one state decided to oppose the whole world and to stand against the whole world with regard to this long-standing issue," Palestinian ambassador Riyad Mansour told the council. "The United States chooses to disregard international law and ignore the international consensus." Pence's trip to Egypt and Israel was pushed back to mid-January to allow the U.S. vice president to remain in Washington during a vote on Trump's tax bill, a White House official said. Palestinian president Mahmud Abbas had already scrapped a meeting with Pence and his Fatah faction had called for mass protests during the visit which had been initially been scheduled for Wednesday. Washington's closest allies, France and Britain, came out ahead of the vote to declare their backing for the measure, which they stressed was in line with positions enshrined in UN resolutions adopted over several decades. The status of the city must be decided through negotiations and "not by the unilateral decision of a third country that would bring us back a century," said French Ambassador Francois Delattre. The U.S. veto came nearly a year after the previous U.S. administration abstained in a council vote condemning Israeli settlements, allowing that measure to pass. 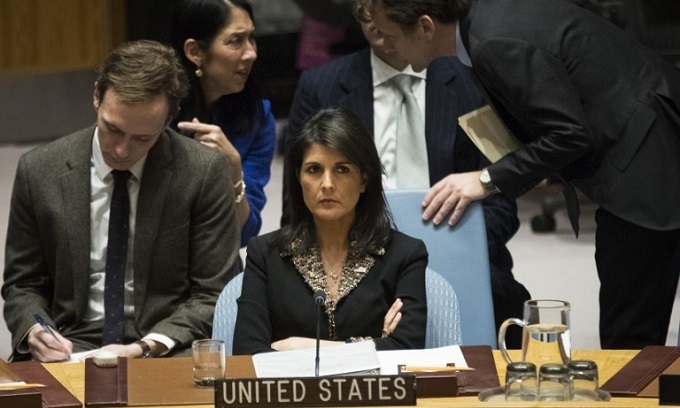 Haley, who used her veto power for the first time as U.S. ambassador, stressed that the United States still supports a two-state solution "if that's what the parties agree to." The Palestinian envoy led a group of Arab ambassadors in a meeting with Miroslav Lajcak, the president of the General Assembly, to schedule a vote on the draft resolution, probably on Thursday. Resolutions by the General Assembly are non-binding, but a strong vote in support of the resolution would carry political weight.